January is a slow contest month on 3G2S. We are steadily recovering from the holidays and getting back into full swing. Thanks so much for sticking with us in the meantime! 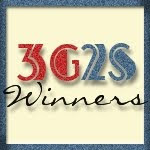 Out of 383 entries, the winner for the Decal Delight Wall Decals contest is . . .
Congratulations to our winner! I will be sending out an official email notification immediately. Please respond within 48 hours to claim your prize. Remember that I always reply to confirm that I have received your information.